True Water Australia has recently been awarded the contract for the commercial sewage treatment plant at Leanda Lei Apartments Lord Howe Island. Leanda Lei Apartments are set amid tranquil gardens and spacious lawns with views towards Mount Gower and Lidgbird. 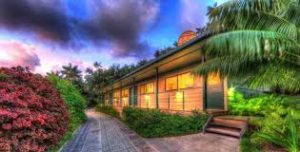 Established in 1954 by Roy and Daphne Wilson it was the first purpose built guest house on Lord Howe Island described as a “honeymooner’s haven”. In 1974 the accommodation was converted to self contained apartments, allowing for more freedom of choice regarding styles of accommodation. All apartments have recently been renovated and refurbished and still remain within the same family today. Appealing to couples and families alike the site offers a mix of king studio, one and two bedroom apartments. The apartments have provision for approximately 50 visitors and staff on site. Accommodation comprises of 19 fully self-contained units in total, one owner’s residence and two staff quarters with a commercial laundry servicing the guest’s needs. Leanda Lei Apartments site have a number of existing systems that are not meeting the Lord Howe Island Boards commercial wastewater requirements and are in need of an upgrade. After making first contact with the True Water Australia team in 2013 the owners witnessed the installation at Capella Lodges in July 2015 before engaging in the upgrade. TWA’s proposal includes decommissioning the 4 existing systems and centralising the location of the new sewage treatment plant. The system being installed is a Kubota HC50A which has the ability to treat 10kL/day and will surpass the Lord Howe Island Board’s commercial wastewater guidelines. As with many other True Water Australia systems on the island an easy, simple and effective system was required; while also providing the best environmental outcome at the World Heritage Site. Installation is booked for completion by end of 2015; keep posted for updates on this commercial wastewater system.